Writing and processing images are the most important accomplishments in human life. Being able to transcribe your thoughts, feelings and knowledge into both text and images is especially important in today's text, email, and social media heavy world. It's also one of the strongest tools to help a student transition into a career. That's why it's so important to tackle dysgraphia, a lesser-known sibling of dyslexia and dyscalculia. This article paints an amazing picture of what Dysgraphia is and what it entails. This video presents a general overview of what dysgraphia is, and what it's potential root causes are. The discovery of dysgraphia is relatively new -- it limits a students' ability to view an image that is displayed to them. Students may struggle in the classroom, and their lack of progress will be telling. And because not much research has yet been done, dysgraphia has been a challenge for teachers to navigate. This video is the first step to educating yourself, and hopefully helping a student with dysgraphia! Dysgraphia is a learning disability that affects the ability to see images and writing abilities. Dysgraphia limits the ability to view an image. Schools are having a hard time helping students who have Dysgraphia, as its discovery was relatively recent. Some wonder if it really is a disability or if it is just a learning impediment for students. 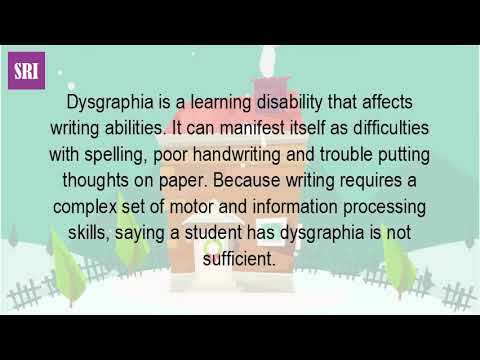 Video of Is Dysgraphia A Disability?